How oil sands royalties are collected and how the system is performing, including data for individual projects. Oil sands are a naturally occurring mixture of bitumen (oil that is too heavy or thick to flow or be pumped without being diluted or heated), sand, clay or other minerals and water. Oil sands operators pay royalties on crude bitumen after the sand and other impurities have been removed. Crude bitumen is worth less than crude oil because bitumen is more difficult to refine than lighter crude, and it does not naturally flow through a pipeline. Diluent is added to allow bitumen to flow through pipelines to market. The cost of removing impurities and adding diluent is considered in the royalty calculation. The framework follows global practices of risk and profit sharing between the owners (Albertans) and the companies that develop the resource. It is a revenue-minus-cost structure that recognizes the unique revenues and costs for each project. Upgraders process bitumen from the oil sands into synthetic crude oil, making it possible to transport and sell. In 2016, about 42% of the bitumen produced was upgraded into synthetic crude oil among 4 upgraders within Alberta. Refineries refine the bitumen or synthetic crude into higher-value petroleum products that are sold to end-users. This includes products such as gasoline, diesel, aviation fuel and asphalt. Today, there are several refineries in Canada and the United States that accept Alberta's bitumen. What is a "Royalty Project"? Most oil sands developments in Alberta are "Royalty Projects." A Royalty Project is an approval issued by the Government of Alberta that meets specific criteria. It allows the operator of an oil sands project to pay royalties under the oil sands royalty regime. Any oil sands development without Royalty Project status will pay royalties according to the royalty rates for conventional oil. The ability for royalty rates to change based on the price of oil is sometimes referred to as a 'sliding scale.' The government has designed royalty rates to change based on the price of oil, so the risk and reward is shared between industry and government. When prices are high the royalty rates are higher, and when prices are low the royalty rates are lower. Royalty rates can be different, depending on whether the Royalty Project is in the “pre-payout” or “post-payout” phase. The pre-payout phase is the period before an oil sands project has reached payout. Royalty rates are lower to account for high initial investment costs and long construction times. Project payout occurs when a project’s cumulative revenues equal or exceed its cumulative costs. Royalties are typically higher in the post-payout phase. Once a project achieves payout it remains in the post-payout phase. During the pre-payout period, a Royalty Project pays royalty based on a percentage of its gross revenues, ranging from 1% to 9%, depending on the price of oil. 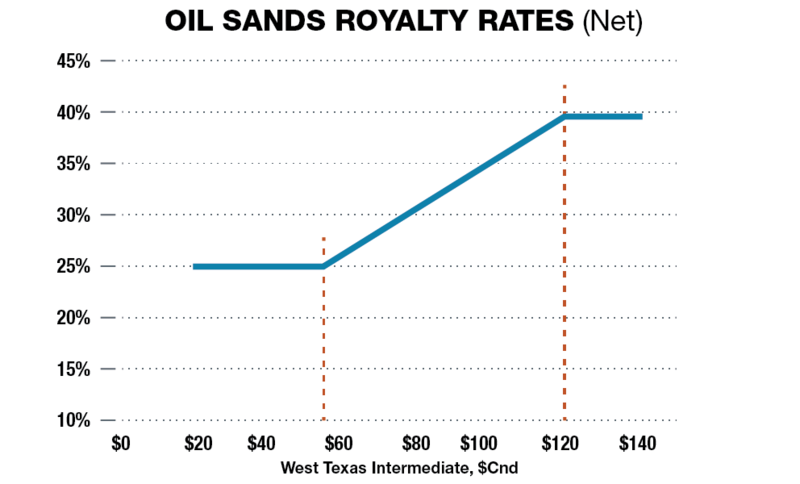 Royalty rates fluctuate based on the price of oil, which is determined by the West Texas Intermediate (WTI) price benchmark for oil, converted into Canadian dollars. 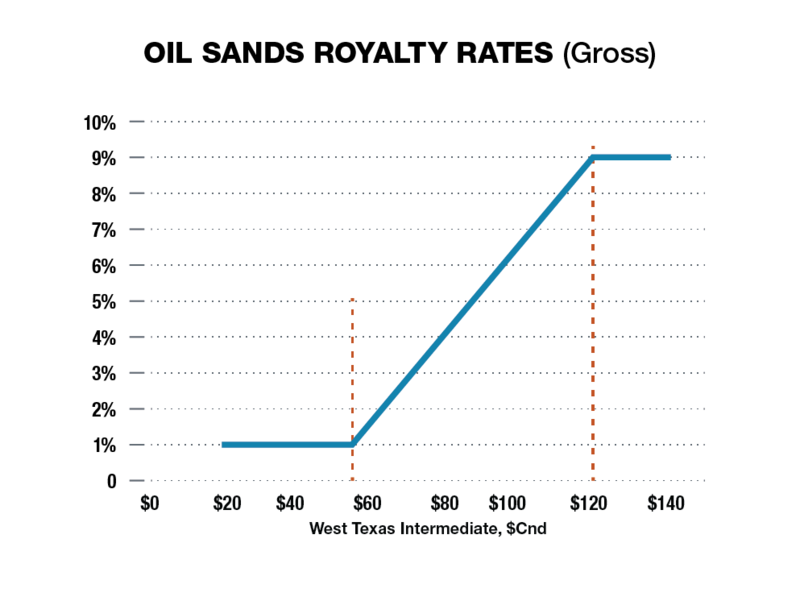 During the pre-payout period the royalty rate is 1% of gross revenues at prices up to $55/barrel. When the price of oil increases to $120/barrel or more, the royalty rate is 9% of gross revenues. The royalty rate increases from the minimum to the maximum between $55/barrel and $120/barrel (see Figure 1). When oil is $55/barrel or less, the royalty rate is 25% of net revenues. When the price of oil increases to $120/barrel or more, the royalty rate is at its maximum, which is 40% of net revenues. Between $55/barrel and $120/barrel, the royalty rate increases from its minimum to its maximum rate in the same way as the pre-payout calculation. Oil sands royalties are calculated and collected on a Royalty Project basis. Each project reports its revenues and allowed costs. This data is used to determine the payout point, which occurs when a Royalty Project’s total revenues equal or exceed total costs. For oil sands production that is not within a Royalty Project, royalties are calculated using the conventional oil royalty rates. The global drop in the price of oil since 2014 has impacted all aspects of oil sands development: revenues and profits, royalties paid, operating costs and new capital investments. West Texas Intermediate, the price benchmark most commonly used for North American oil, fell from $105.15 USD in June 2014 to $30.62 USD in February 2016 – a drop of more than 70%. Western Canadian Select, the price benchmark that more closely resembles the price oil sands producers receive for their crude bitumen, fell from $86.56 USD in June 2014 to a $16.30 in February 2016 – a drop of more than 80%. Investments in the oil sands continued to decline, going down from about $23.4 billion in 2015 to an estimated $16.6 billion in 2016. Royalty payments from oil sands projects fell to $827 million in 2016, down from over $1.4 billion in 2015, a 42% decline. The drop in the West Texas Intermediate (WTI) price from $105.15 USD in June 2014 to a low of $30.62 USD in February 2016 was one of the most prolonged periods of depressed oil prices in recent history. Due to quality and transportation differences, oil sands producers receive a much lower price for their products than the WTI price. Western Canadian Select (WCS) is a price benchmark that more closely resembles the price oil sands producers receive for their crude bitumen. WCS is typically 12-35% lower than WTI, but has been more than 40% lower than WTI at times. WCS is never higher than WTI. WCS saw an even more dramatic and prolonged drop, falling from a high of $86.56 USD in June 2014 to a low of $16.30 in February 2016 – a drop of more than 80%. Of the 120 oil sands Royalty Projects recorded in 2016, half were in the pre-payout phase, which pays less royalty. There's a rise in production from pre-payout projects due to new projects coming online and their production ramping up. These pre-payout projects will transition to the post-payout royalty rate once their cumulative revenues exceed their cumulative costs. Oil sands Royalty Project costs continued to decline in 2016 as oil companies continued to reduce costs to remain as cost-competitive as possible in a low oil price environment. Diluents are one of the largest costs to producing and transporting bitumen. They're a significant component of royalty project costs in 2016, increasing slightly compared to 2015 but still significantly below 2014 levels. Capital investments in the oil sands made up the vast majority of upstream oil and gas investment in Alberta over the past decade. Due to the sharp decline in the price of oil in 2015, investments in the oil sands also declined, yet still remained the major driver for capital investments in Alberta. In 2016, capital investment in the oil sands for royalty purposes fell further to approximately $12 billion. Steady increases in revenue from 2009 to 2014 were the result of relatively sustained oil prices, the completion of new projects and production increases from these projects as they came online. The drop in revenue in 2015 and 2016 is a direct result of the drop in the price of oil. The data provided gives an overview of the costs, revenue and royalty paid for each oil sands project in Alberta for 2016. The information published here is royalty project data, and this information is only relevant to and arises from royalty calculations, and is solely intended for the purposes of calculating royalties under the Oil Sands Regulation, 2009. Please note that the information published here may differ substantially from other financial information, including but not limited to financial or accounting data reported for income tax purposes, financial statements or other reporting to stakeholders, whether at an oil sands project level or corporate level. The oil sands royalty project data published here is derived in accordance with the Oil Sands Royalty Regulation, 2009 and the Oil Sands Allowed Costs (Ministerial) Regulation. It is not comparable with other financial data and is not intended to be used for comparison purposes with any other financial data. In 2016, Alberta received about $837 million in royalty payments from oil sands Royalty Projects, down from the $1.4 billion paid in 2015 and $6.1 billion paid in 2014 – a direct result of the drop in oil prices, and their impact on net revenues. Although oil sands project costs continued to fall in 2016, this did not offset the impact of falling oil prices on royalties. Between 2015 and 2016, oil sands royalties fell by 42%. The effective gross royalty rate is a rough average of the royalties that all projects paid divided by the cumulative gross revenues of all projects. Actual royalty rates for oil sands Royalty Projects are determined on a monthly basis, based on the price of oil and whether the project is in pre- or post-payout. Post-payout projects generally pay royalties on net revenues. Calculating the effective gross royalty rate (royalties divided by gross revenues without accounting for costs) allows for a rough comparison between pre-payout and post-payout projects. The effective gross revenue royalty rate for oil sands Royalty Projects in 2016 was 1.6% for pre-payout projects and 5.2% for post-payout projects. Alberta publishes summaries of audits and the audit adjustments. Audits are typically concluded several years after the data is reported. Annual summary data is published for historical years, not the current year.